At the Fortress of Louisbourg in Nova Scotia, Canada, you will find a community that works together to make this tourist attraction come to life during the summer months in Nova Scotia, Canada. Two men dressed in appropriate clothing for the time period they are living in, do some gardening chores to ensure that there will be food for their families. Fortresse, Louisburg, Nova Scotia,Canada, North America. 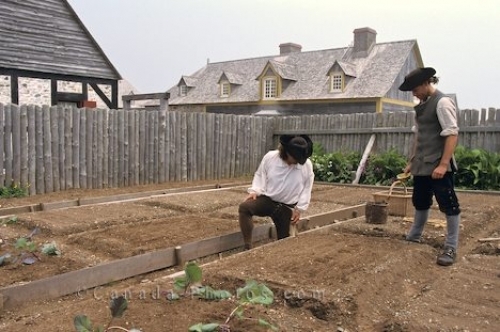 Picture of two men in costumes spending their day fixing the gardening posts at the Fortress of Louisbourg in Nova Scotia.